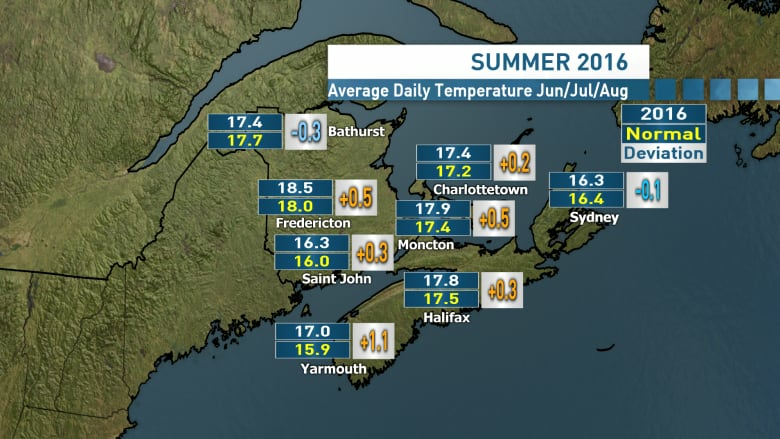 Why was Nova Scotia's summer so hot and dry? There isn't just one reason, says CBC meteorologist Kalin Mitchell. The summer of 2016 was great for the beaches but not so much for wells, wildfires or agriculture. 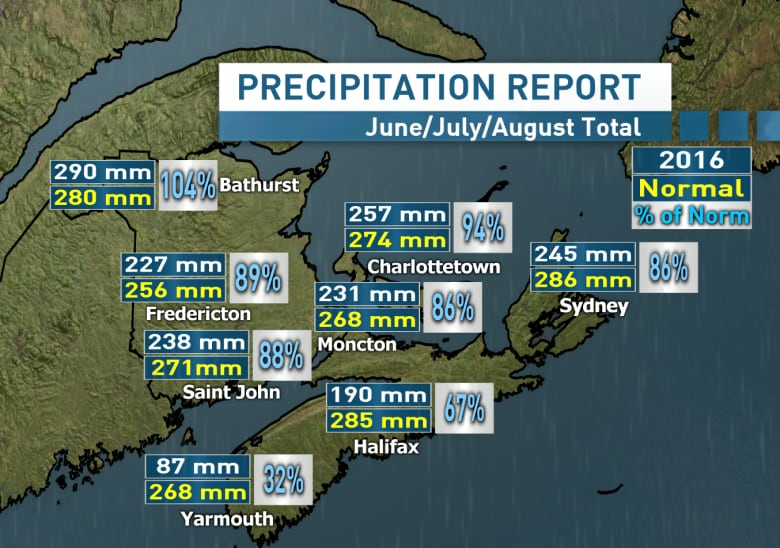 This summer in Nova Scotia had some standout extremes for temperature and precipitation. Here's a look back at how the summer stacks up. The average daily temperature is finishing above the 30-year climate norm across Nova Scotia except for a few areas of Cape Breton, which were almost dead on with the norm. The greatest deviation from the climate normal occurred in southwestern areas of Nova Scotia. Yarmouth came in more than a full degree above the norm, which is a big deal in the context of the entire season. The average daily temperature of 17C in Yarmouth was good enough to rank fourth of 137 record entries. Greenwood ranked sixth of 74 available record entries with an average daily temperature of 19.2C. A big contributor to the warmer temperatures in the southwest was the lack of rain. The Yarmouth weather observation station recorded only 86.6 mm of rain this summer. That's barely one-third of the 30-year climate normal of 267.5 mm, making 2016 the driest summer on record in Yarmouth going back to 1880! And who could forget the massive Seven Mile Lake wildfire? 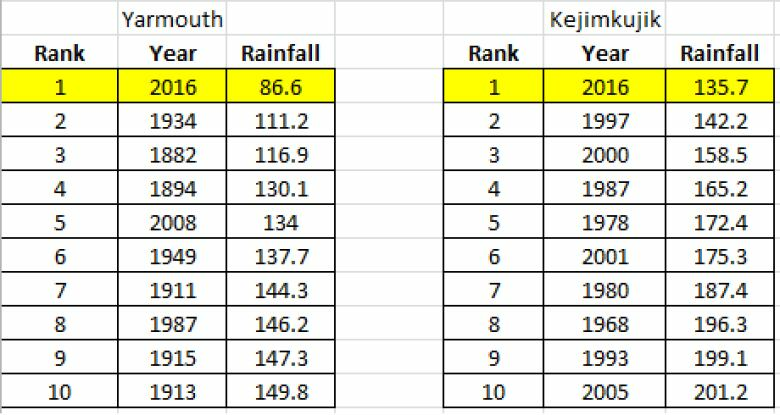 Lack of rain played a major role, with the observation station at Kejimkujik reporting the driest conditions going back to 1966 with only 135.7 mm of rain this summer. Move northeast in the province and rainfall totals slowly climb towards normal values. Halifax saw two-thirds of the climate normal and Sydney was at 86 per cent. Even in these areas, extended dry periods made things difficult for gardeners. Why so hot and dry? I wish I had a single issue to blame the exceedingly dry conditions in the southwest on. In the summer months we do typically see a much larger variation in rainfall for the province due to summer rain coming in the form of scattered showers and thunderstorms. Those tend to be highly local weather systems, bringing a downpour to one community but completely missing another just down the road. One thing I did observe this summer was a lack of weather fronts that stalled or became stationary over us. In those situations, we typically see rain or showers for an extended period of time—even heavy rain if the front manages to tap into moisture over the Atlantic. This was related in part to the jet stream, which flowed almost directly west to east over us much of the season. That pattern is favourable for moving weather fronts through quickly, reducing the time they have to bring us rainfall. There's no sign of a soaking rain in sight over the next several days. Unfortunately a passing front on Friday will only bring showers amounting to a few millimetres. Another round of very light showers is likely for Sunday. That will be followed by high pressure in place for the start of next week, with dry conditions likely extending into Wednesday or Thursday. Climatological models run by Environment Canada indicate a fall that will finish with an average temperature exceeding the climate normal. Rainfall is predicted to be near normal, so fingers crossed that is the case. Rainfall amounts typically increase 10 to 20 per cent for September over August, and 20 to 40 per cent for October. 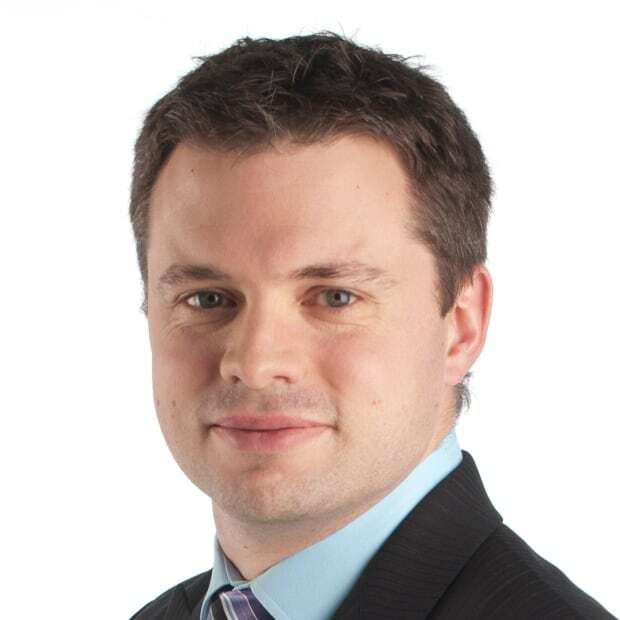 Kalin Mitchell is the meteorologist on CBC News Nova Scotia, CBC News New Brunswick and CBC News Atlantic Tonight. He can also be heard on various afternoon CBC Radio shows giving up-to-the-minute weather forecasts.